The issue generating the most debate among Big Ten coaches was how to deal with the volume of players transferring between programs. ROSEMONT, Ill. — The Big Ten Conference men's basketball coaches are trying to find ways to slow the carousel of transferring players. That issue generated the most discussion after the league's coaches met here Tuesday, with a particular emphasis on players who have already earned a degree but want to spend their final year of eligibility at a new school. The so-called grad transfers are allowed to play for a different team for one season while ostensibly earning a master’s degree, although few of them actually fulfill the academic end of that bargain. “We’re heading down a slippery slope of ultimate free agency, which I don’t think anyone wants. 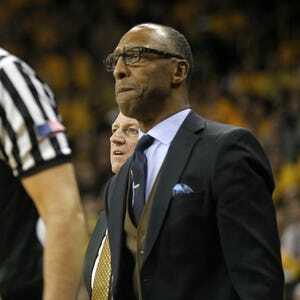 I think that would create a firestorm,” Northwestern coach Chris Collins said. 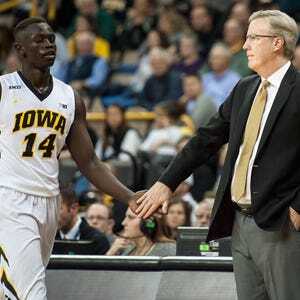 Iowa coach Fran McCaffery has long opposed the grad transfer rule, and thinks it would work better if the transferring player received two years of financial aid in order to get a master’s degree, but could only play basketball in the second year. “It was an academic rule at the beginning. It’s become an athletic rule,” he said. “I think (his proposal) is a win-win. Will that be well received? I don’t know. Northwestern, at least, offers some master’s programs that can completed in one year. Purdue head coach Matt Painter said he recently discovered a scenario at Purdue in which a player could get a master’s in a year by attending summer school on both sides of the regular academic year. “They’re making their moves, a majority of them, for basketball reasons. What the rule is intended for, it’s not happening most of the time,” Painter said. Division I teams outside of the major conferences are being particularly hard-hit. Collins used the word “poaching” to describe what is happening. Of course, most high-major programs are willing to take on grad transfers if it means adding a skilled, veteran player to its roster. “When the rule presents itself, what do you want us to do? Because they’re going to go somewhere,” said Painter, who is poised to accept Michigan grad transfer Spike Albrecht this fall. Iowa’s nonconference slate is pretty well set this winter, except for the imminent announcement of its foe in the Big Ten-ACC challenge, which will be a road game. But the Hawkeyes haven’t yet seen a league schedule and don’t even know which teams they will face twice and which just once. McCaffery said he’s in no particular hurry to receive that information. “Everybody wants to break a schedule down. I look at it as, it’s a tough league. Everybody’s good. You’re going to play tough games,” he said. “The only beef I had last year was I wished we had a Saturday home game. But you know what? Sometimes it doesn’t work. I’m sure it will work this year.